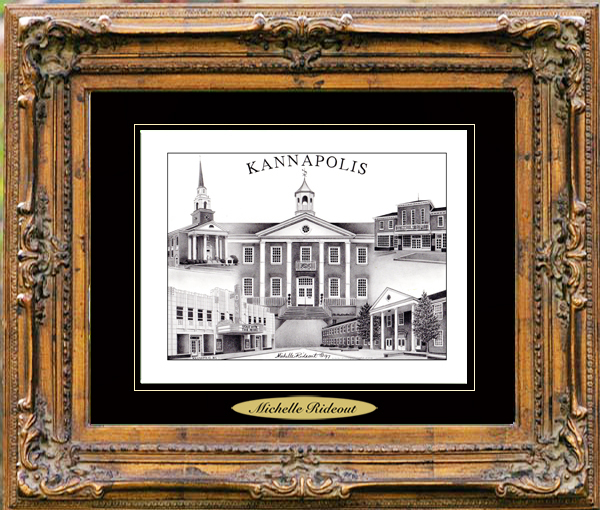 The Village Prints drawing of Kannapolis, North Carolina, by Michelle Rideout, depicts several historical buildings such as the old Cannon Mills, the courthouse, city hall, an old movie theater, one of the churches, etc. In 1906, James William Cannon bought several farms to build Cannon Mills Company. Under the guidance of James Cannon’s son, Charles, Cannon Mills became the world’s largest producer of household textiles and a household name. Kannapolis was built as a mill village of small craftsman-style homes. The mill employees lived in the homes for a low rent and enjoyed free maintenance, low- cost utilities, and free garbage collection and disposal while paying no taxes. The Cannons also provided a YMCA, a hospital, a police department, scholarships, loans and jobs. In 1982, California financier David Murdoch took over Cannon Mills. Murdock merged the mill in 1985 with Fieldcrest Mills Inc. creating Fieldcrest Cannon. In 1984, the citizens of Kannapolis voted to incorporate making the largest unincorporated area in the United States the 16th largest city in North Carolina. The Pillowtex Corporation purchased Fieldcrest Cannon in 1997. The City prepared for the day the mill would close. In the mid-1990s, 10 square miles of land to the west of Kannapolis was identified as a growth area and annexed to the city.